The N.C. Industrial Commission recently enacted a new rule (04 NCAC 10A .0609A) setting forth the procedure by which a party can seek a ruling from the Commission on disputes involving medical issues only. The procedures, decision makers and time frames differ, depending on whether the medical issue is an “emergency” and what type of forum is desired. The rule was designed to ensure prompt decisions while keeping the process fair. So whether you are filing the Motion or the Motion has been filed by your opponent, you better get ready because things move quickly. 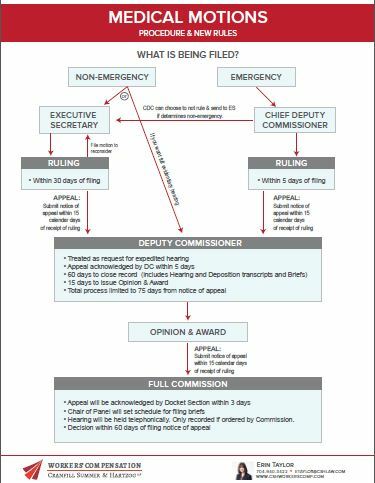 If you are interested in a copy of the flow chart outlining these new procedures (like the one below), submit your email below and we will send you a link to download your copy.